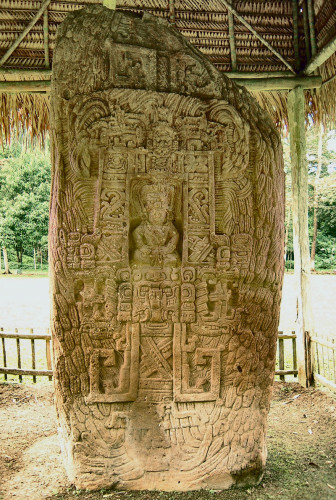 Fig W0962 – Stela AThe Stelae of Quiriguá are one of the wonders of the Mayan world. Whilst the idea of producing stelae was common amongst the Maya, at Quirigua it reached a much higher level (quite literally) as they erected the largest monuments in Mesoamerica. Like all Mayan stelae, the stelae at Quiriguá are encrypted with information and almost every square inch of these massive monuments is engraved with little bits of information. Whilst much of this information is clearly engraved within boxed hieroglyphs on the sides of the stelae (as seen on the side of Stela A in fig. W0962), the regalia of the Lord pictured on the stelae is often encoded with far more information. Everything from the feathers and ornaments of their headdress, to their boots, and even the way their feet are positioned, are all artistic devices that are designed to be read like words in a book. There are two things that make the stelae at Quirigua more magnificent than those found elsewhere. Firstly, the craftsmen were incredibly skilled which may reflect Quiriguá’s safety and fortunes. Secondly, and equally importantly, the type of sandstone in the area is incredibly hard, which meant the craftsman were able to carve the faces out in an unfamiliar mid-relief style to produce 3D images of the rulers of Quirigua. This tougher rock also meant they could quarry enormous monolithic blocks to create the most gigantic monuments found in Mesoamerica. 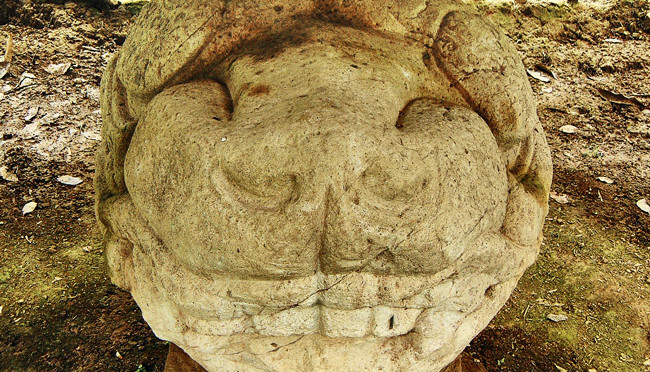 It is also interesting to note that monuments were defaced when the cities were abandoned, with particular attention being made on breaking the nose off – an action repeated across Mesoamerica. It is thought that this is symbolic of a belief that the statues were filled with the living power of the person they represented and that the soul of a living person resides in the nose – curiously, this belief was also held in Asia. Therefore, destroying the nose was effectively killing the monument. Stela K features Quiriguá’s last ruler, Jade Sky, dressed in full lordly regalia with a double crown headdress, large round ear spools with pendants hanging from them, necklaces of jade beads, a large square apron which covers his tunic and jaguar heeled boots. He also holds a bar across his chest which is terminated with a badly eroded serpent head at either end. The apron is of particular interest as it contains some important information about Jade Sky’s divine power. The apron features two large serpent heads, which are formed by two squared spirals facing away from one another, found midway down his body. The spirals are the serpents noses and upper jaw, and you can see the semi-circular teeth running along the bottom of the spiral. Below that, you can see a tongue flopping out of the mouth above another row of squarish-circular teeth and the bottom jaw. The eyes are formed by the “C” shapes which are just above the squared spirals. In fig. W0985T the two serpent heads are highlighted and you should be able to see their dual purpose, which is to create the trunk of a tree. The snouts represent the base of the trunk and tongues are the roots. The back of their heads project upwards to represent the serpents body and form the trunk. A God’s face is set within the trunk of the tree between the two spirals, to symbolise the tree’s sacred power. In fig. W0985T the God’s head is shaded slightly red to make it easier to see. You should clearly make out his eyes and the tongue which is flopping out – which often signifies that the god feeds on blood. The combined imagery tells us that Jade Sky is a divine tree, with his roots planted in the underworld, his body spanning the living world and filled with the strength of the God, and his head rising to the Gods of the heavens. 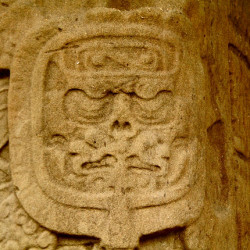 The heels of his shoes are backed with two jaguar/serpent God faces looking toward one another at the very bottom of the stela. The faces have curling fangs emanating from the upper jaw, but then have human lower jaws, on which you can see a row of teeth. The protrusion from the nose represents breath and tells us the animal-God is alive. The above images are close-ups of various part of Stela K. The first, fig. W0986, is from the other side of the monument, which also features the God’s face within the trunk of a tree made from snake jaws. Fig W0987 is a close up view of a glyph found on the corner of the stela and appears to depict a bird-God – possibly Itzamna. Fig W0984 shows glyphs from the right-hand side of Stela K which appear to begin with a gruesome, alien being flying in a UFO. This curious glyph signifies the current era, which began in 3114AD, and tells us a date is going to follow that corresponds to the current era. The glyphs are read from left to right, starting from the top, with the pictures denoting the periods of time (i.e. years, months, days), and the dots (equalling 1 each) and vertical bars (equalling 5 each) providing the quantity of those periods. For example the top left is 9 B’ak’tun – approximately 3546 years, as each baktun roughly equals 394 years. This is followed by 18 Katuns – about 360 days, and so on. The full text (click here to view) provides a date of 9.18.15.0.0 3 Ahau 3 Yax, which equates to the 22nd July 805. Stela D was built for Cauac Sky who is easily identifiable by the unusual Pharaonic beard. Cauac Sky was the most prolific and powerful ruler in Quiriguá’s history, coming to power in 724AD and reigning for an incredible 61 years. This Stela dates to 9.16.15.0.0, which equates to the 17 February, 766AD. 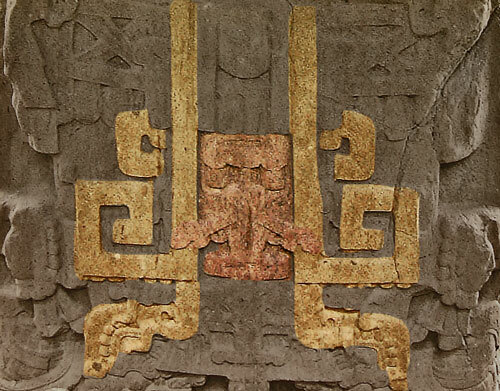 Like Jade Sky on Stela K, Cauac Sky wears an apron with two out-turned serpents heads that act as the roots and trunk of the divine tree of heaven. He also wears the same double headed headdress, but his has a third head, a skull, right at the top. Like Stela K, he has large round ear plugs, with four dots on them which symbolise the sun and the universe. 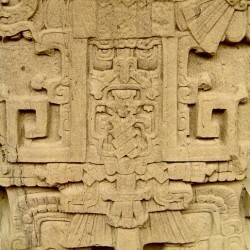 Across his chest is the emblem of Chac, the God of Rain and Thunder. On his feet, which face outward, he wears pompoms and on his heels are faces looking inwards (see fig. W0969H). Cauac Sky holds a the “manikin” sceptre in his left hand featuring God K, the God of wealth and kingship. In fig. W0969C you can see the sceptre highlighted and it should be clear that Cauac Sky holds the little God’s right leg in his left hand and the left leg is bent at the knee. Fire emanates from God K’s forehead and sacred quetzal feathers sprout from his headdress. 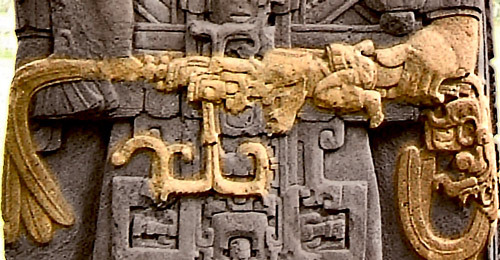 Following through the back of Cuauc Sky’s hand, the handle of the sceptre turn into a serpents head with quetzal feathers sprouting from its fanged mouth. In fig. W0969H you can see a close up of Cauac Sky’s heels which are represented by two gruesome heads staring inward at one another. The two dashes or stripes on their headdresses mean “shee”, which is the word for “fear”. This tells us that these heads are the lords of Xibalba (“sheebaalba”) who rule the underworld, or “place of fear” to be exact. This same emblem, of two stripes, also appears above the gruesome skull at the very top of Stela D. These two references presumably combine to tell us that Cauac Sky embodied fear, or the underworld, from top to toe. 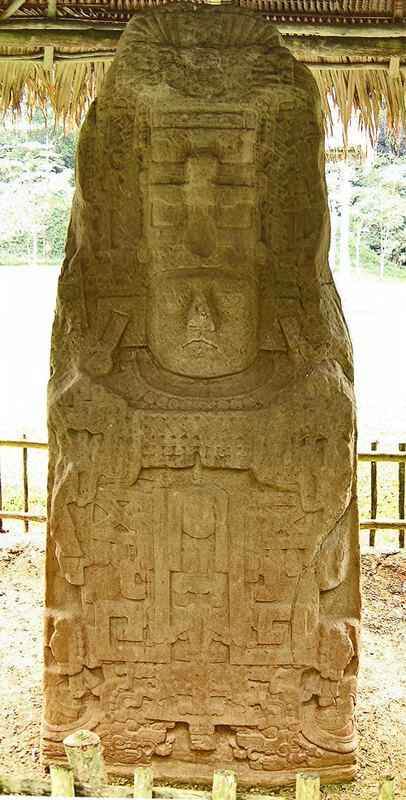 Stela A (Monument 1) and Stela C (Monument 3) are twins and were dedicated by Cauac Sky on the 29th December 775AD. They may look life size here, due to proportional nature of these stelae, but they actually tower an impressive 4 metres. Stela C is of particular interest as it describes the Mayan Creation Myth at length and has provided historians with an unparalleled insight into how the Maya believed their existence began. The text tells of three stones that were planted to inaugurate the current era, an event which it dates as 3114BC. 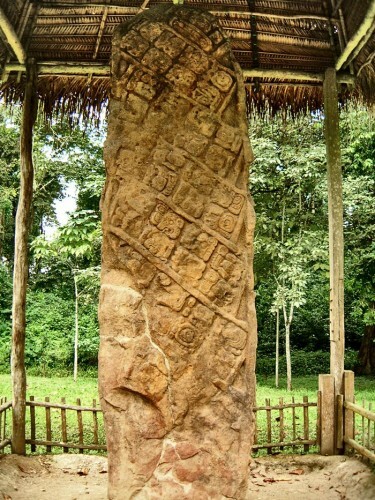 Stela C tells us the first stone was the Jaguar Throne which was planted by “The Paddlers”; the second stone was the Snake Throne, planted by an unknown God; and the third stone was the Water-Throne, planted by the great god, Itzamna (click here to read the full article on the myth and these stelae). Stela E is the largest monolithic monument ever erected in the New World. It stands a monstrous 10.6 metres tall and even with 3 metres of it is sunk beneath the ground to hold it upright it still towers comfortably over a two-storey house. Stela E was dedicated on 9.17.0.0.0 13 Ahau 18 Cumhu (the 22nd January 771AD) to commemorate the completion of the 16th K’atun (a period of 7200 days). 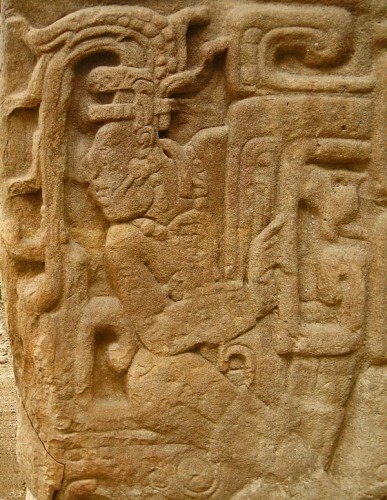 Stela E features Cauac Sky (K’ak’ Tiliw Chan Yopaat) holding the “Manikin Sceptre” in his right hand to show his divine rulership, as seen in on Stela D (fig. W0969C) and stands on a plinth featuring the Earth Monster. 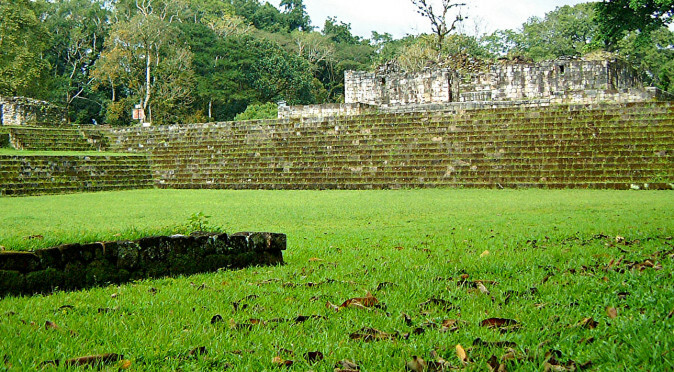 Quiriguá was founded by Copán in 426AD to control the trade running along the Motagua river, which stretches west to the far side of Guatemala, almost to the Pacific Ocean. The river provided easy transportation of goods across the southern Mayan lands, including the immensely valuable jade trade from the Motagua Valley. 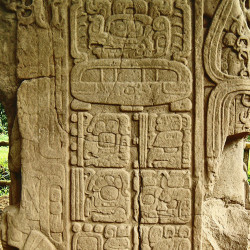 Stela E is inscribed with glyphs that tell us Cauac Sky was crowned by Uaxaclajuun Ub’aah K’awiil, the ruler of Copán, in 724AD. 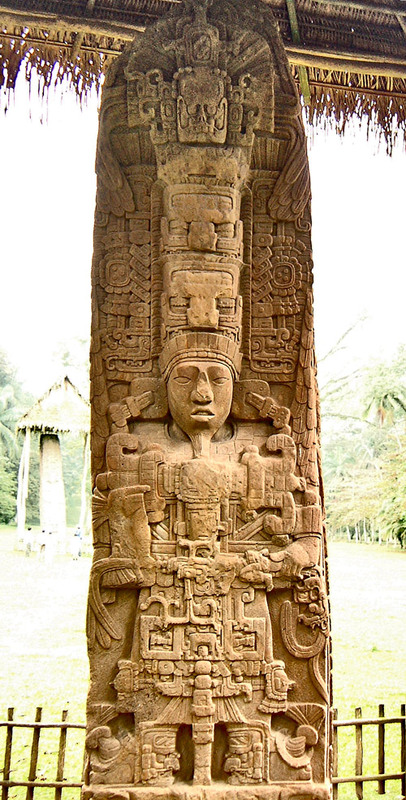 However, Stela J tells us that 12 years after being crowned, Cauac Sky captured and beheaded Uaxaclajuun Ub’aah K’awiil to bring about Quiriguá’s independence in 738AD. So between the two monuments, we know that Cauac Sky turned against the very man who made him King. These were the two defining moments in Quiriguá’s history and provided the inspiration, power and finances for the majority of monuments that you see Quiriguá today. Stela E was probably built on this enormous scale to ensure that it could be seen by anyone sailing along the river. 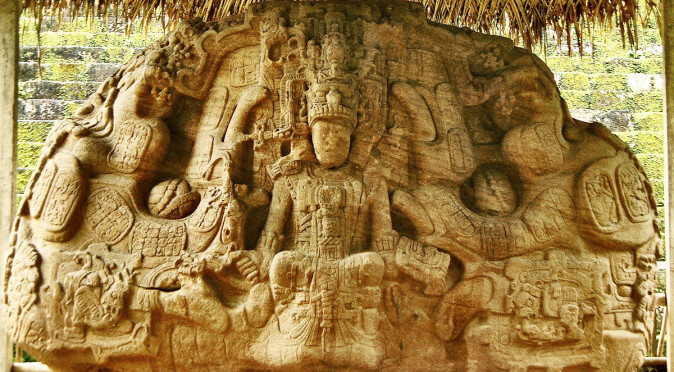 This imposing monument would have ensured that any passers by would be left in no doubt that Quiriguá and this mighty figure, Cauac Sky, commanded the river banks independently of Copán. Dedicated in 800AD, Stela I is incredibly ornate and remarkably different from the other stelae in almost every respect. It is of little surprise that it was created by one of the latter rulers, and in fact the last ruler, Jade Sky. On this monolith, Jade Sky is depicted sitting on a raised throne surrounded by the Sky Band. All around the periphery of the monument is the imagery of corn and abundance. It is likely that this monument was erected in the hope that it would prompt a return to the happy days of abundance, rather than celebrate abundance. It is now known that widespread drought caused several cultures to collapse in the 8th and 9th centuries – including the Maya. Quirigua was abandoned shortly after this monument was erected. According to a translation by Matthew Looper, Stela I describes a visit in 736AD from the ruler of Calakmul, Wamaw K’awiil. This has led to a proposal that Calakmul may have funded Quiriguá’s expansion and eventual fight for independence against their master, Copán. The back of Stela H is most unusual, as you can see in fig. W0991. In the top right corner, it features the date glyph (signifying that a date is to follow) which is angled at 45° clockwise, so it reads from top right to bottom left. As Mayan glyphs are written in pairs, the immediate thought is that it would be reading from top left to bottom right. So it is doubly strange that it is not only diagonal, but grouped in fours. 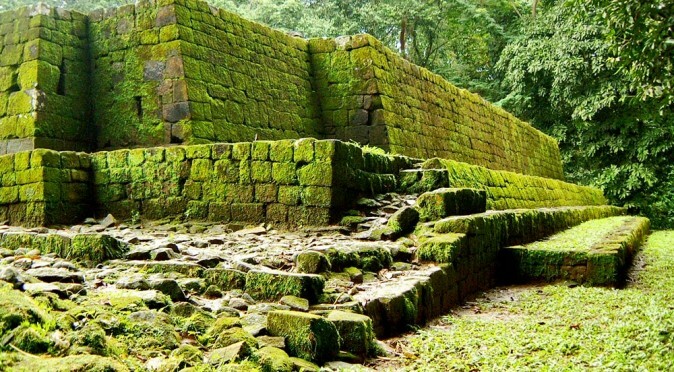 Suffice it to say, this is very uncommon – in fact only one other example has been found, in the little known site of Cancuén, 150 miles northwest of Quirigua. 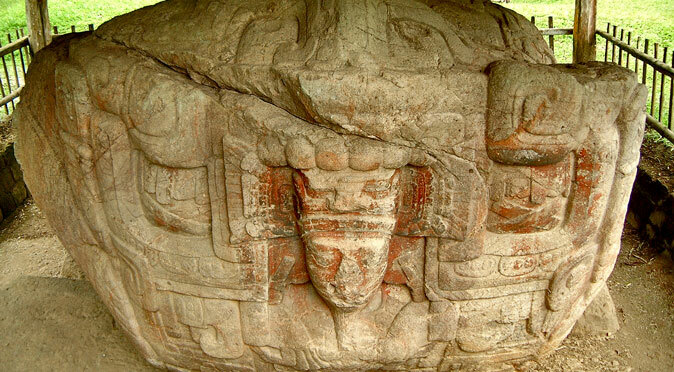 The date reads 9.16.0.0.0, 2 Ahua 13 Tzec – 7th May 751AD, which makes it one of the earliest monuments that Cauac Sky erected. Fig W0992: The Corn GodOn the side if Stela H is a wonderful depiction of Cauac Sky as the young God of Maize, emerging from the roots of “World Tree”. Corn was the main sustenance for the ancient Maya, and any ruler who could provide corn in abundance was considered to be an embodiment of the God of Maize and highly revered. Cauac Sky reigned for an astonishing 61 years which suggests he was able to keep the people of Quirigua very well fed and happy. The Corn God, and indeed the “World Tree”, are both tied in to the Creation Myth that was later referenced in Stela C and the trinity of stones which includes Stela A and Zoomorph B (click here for more info…). Stela H may therefore be an early indication of Cauac Sky’s ever growing belief that he was the “Great Ruler”. 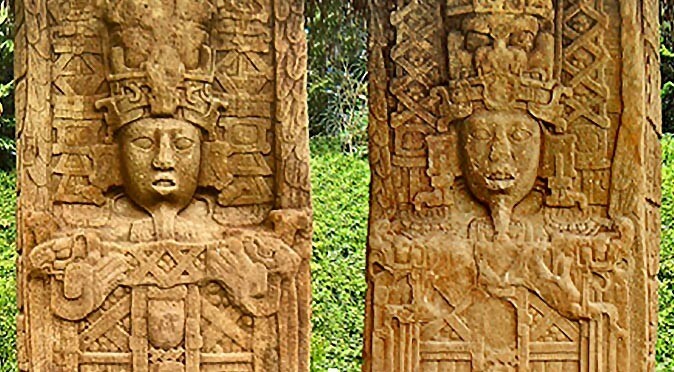 Quirigua was little more than a trading outpost until a ruler named Cauak Sky claimed independence and built some of the most amazing monuments ever built by the Maya. 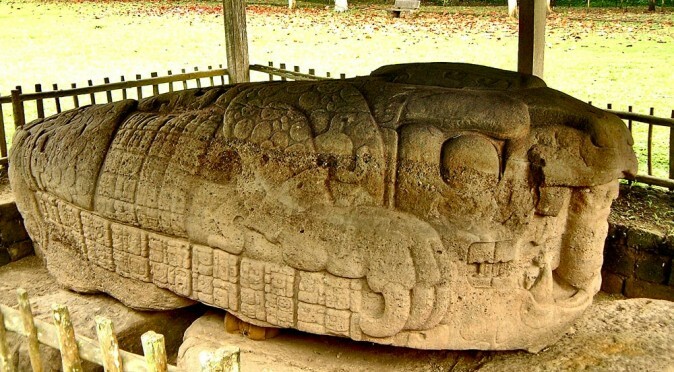 Weighing as much as 20 tuns and encoded with mystery, the zoomorphs of Quirigua are amongst the most profound and amazing pieces of art ever produced by the Maya. 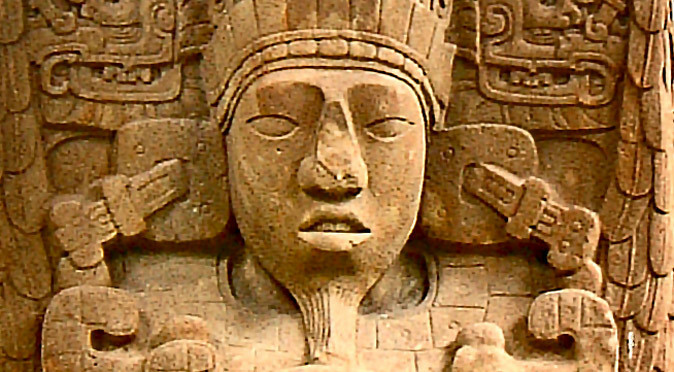 Is This the Face of the Pharoah of Quirigua?